1 million votes cast for the semifinals, 50K more than last year’s vote totals for the semifinals. Over 38 million votes cast overall in the Madden NFL 25 Cover Vote. Adrian Peterson posted the largest margin victory, with 68% of the vote against Arian Foster. Barry Sanders won with a slim margin victory defeating Jerry Rice, 52% to 48%. It’s all too fitting that the Madden NFL 25 Cover Vote Finals come down to Barry Sanders and Adrian Peterson, two of the greatest running backs in NFL history. Sanders has cemented his place in NFL history with his 18,000 career yards, while Peterson came within nine yards of breaking Eric Dickerson’s single season rushing record last year. Making the feat even more impressive, Peterson had his incredible year after coming back from surgery for a torn ACL in the offseason. Fans are invited to cast their votes at ESPN.com/MaddenVote through their PC or mobile devices. For the chance to “Maximize” votes, ESPN and Madden NFL 25 have collaborated with Pepsi MAX to promote Twitter live voting every Tuesday throughout the campaign, where tweets with each player’s respective Cover Vote hashtag will count as two votes. Double votes ends at midnight ET each Tuesday. 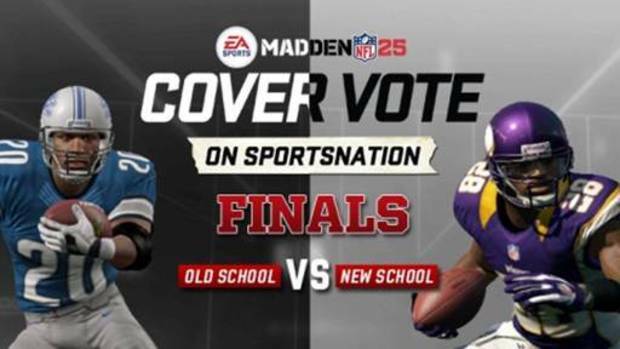 The winner of the Madden NFL 25 Cover Vote will be revealed live on ESPN SportsNation at 8 pm EST on Wednesday, April 24.